Powers: Being a hybrid she had an enhanced physiology. While not explicitly stated in her appearance while asleep she projected a hologram of her dreams suggesting she had unspecified or undeveloped light based powers. Technology: Aliyah uses artificial wings to accomplish flight and gun based plasma blasters in combat. She also has command of a shiar class battle ship. Aliyah Bishop came into this world as a result of the time the X-man Bishop was stranded in space and traveling with Shiar princess Deathbird. After months together the two grew close and fell in-love. She was conceived on one of the many planets they ventured to while journeying throughout space. Some time later her father returned to Earth and her mother kept her conception secret. She grew up under the watchful and surprisingly loving care of Deathbird. In Aliyah, Deathbird saw her beloved Bishop and knew that the future of the Shi’ar Empire lay within her especially after her Lilandra, Aliyah’s aunt went insane [X-men The End Book 1 #1]. Before leaving her daughter Deathbird trained her daughter in unspecified skills [X-men The End Book 2 #3]. Aliyah was the one to discover a clandestine meeting between the Kree; who had hopes of remaking their empire after being defeated by the shiar years earlier; and the slavers on a shiar planet. She disrupted the exchange and fought off X-men turned hounds Siryn and Nocturne.Things escalated quickly as War Skrulls tried to prevent the Kree from making off with a mysterious cocoon which was the cause of the initial meeting. The Cocoon quickly opened and a bald woman emerged saving her from the War Skrull before collapsing. The Brood then arrived and Aliyah quickly secured the woman and Nocturne before making her escape aboard her ship. With the brood overrunning the planet and the need to secure her cargo at all costs she engaged her warp drive while still in the planets atmosphere resulting in the planet’s atmosphere igniting before it exploded [X-men The End Book 1 #1, October 2004 ]. The bald woman she rescued turns out to be Jean Grey, the legendary Phoenix [X-men The End Book 1 #1, October 2004 ]. 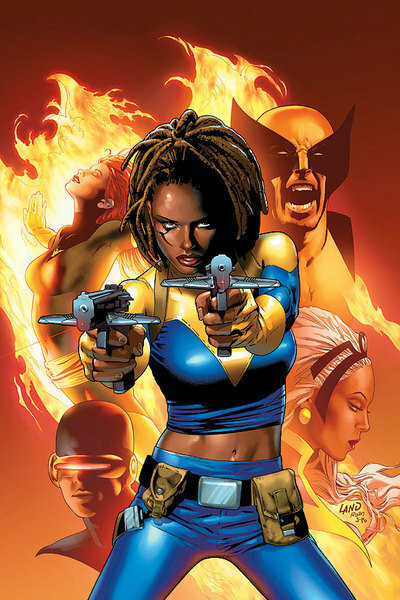 Aliyah took it upon herself to warn the Shiar empire of the return of the Brood though this put her crew at risk, including the still not completely powered Phoenix [X-men The End Book 1 #2]. Phoenix later told them that someone had declared war on the X-men based on earth and had all but wiped them out while they headed toward the Shiar throne world [X-men The End Book 1 #6]. When Carol registers something wrong on the ship Aliyah goes to investigate finding a crashed ship, a fast moving unseen enemy and blast doors ripped open. The enemy is revealed as her mother Deathbird but their touching reunion is cut short when Deathbird is revealed as possessed by a Brood Queen and injures her before having it’s head blown off. 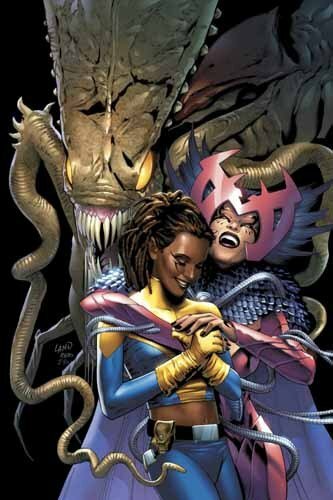 Infected by a brood Queen Embryo she is taken over and returns to her crew not revealing what took place [X-men The End Book 2 #3]. Still possessed by the Brood Queen she attacked her crew once they reached the Shiar throne world [X-men The End Book 3 #2]. She finally met her father when he alongside Psylocke and Tessa came to rescue the Phoenix from the clutches of the Brood [X-men The End Book 3 #4]. Once on the throne world she attacked Xavi the son of Professor-X and Lilandra, the only remaining Nermani besides herself. They fought savagely but she manged to plunge her dagger deep into his chest. She was still possessed by the Brood Queen while he was possessed by Cassandra Nova [X-men The End Book 3 #2]. In the final conflict with Cassandra Nova who was the mastermind behind everything she was freed of the Brood Queen possession and served as enough distraction for the X-men to play their last Gambit ending the threat [X-men The End Book 3 #6]. After the climatic battle she becomes the Empress of the Shiar Empire, being the only surviving member of the Neramani family to have survived the war, with her father as her consul [X-men The End Book 3 #5]. On the anniversary of the final battle she goes to earth alongside her father to celebrate the victory and honor those who died in the war [X-men The End Book 3 #6].